The small round fruits of the Amla tree are packed with the goodness of Vitamin C and Antioxidants. The mildly sour and astringent fruits have an incredible cooling effect on the entire body. They also boost your immunity, accelerate digestion and keep your body fit. When your internal system is ship-shape, that automatically reflects in your skin and hair. Consuming amla regularly helps you get lustrous hair and beautiful skin. One of the most convenient ways of incorporating amla in your diet is in the form of amla juice. Let see how to make it and what the benefits of amla juice are for skin and hair. Agreed that any juice tastes great when there is salt and sugar in it, but since we are drinking the juice for health reasons, you could avoid the seasoning. If you must use it, then use the salt and sugar in moderation. Wash and clean all the gooseberries. A kilo would have about 25-30 medium sized gooseberries. Chop them into quarters and add them to your blender. Blend it well until it becomes pureed. Strain this puree in a muslin cloth. Separate the juice from the pulp. Whizz the pulp again in the blender and strain. Do this couple of times until all the juice has come out. Discard the pulp. Take a part of the juice and to it add the salt, pepper and sweetener if you like as per your taste. You could also add ginger, cardamom and lemon for additional flavoring. Blend in the mixer and add it to the remaining juice. You can store the concentrate in the fridge for a month. Else, you can freeze it in your ice tray, transfer the cubes in a freezer safe bag. The frozen cubes can be used over three months. Add 1 part of the concentrate to 3 parts of water or 2 cubes in 200 ml water and mix. 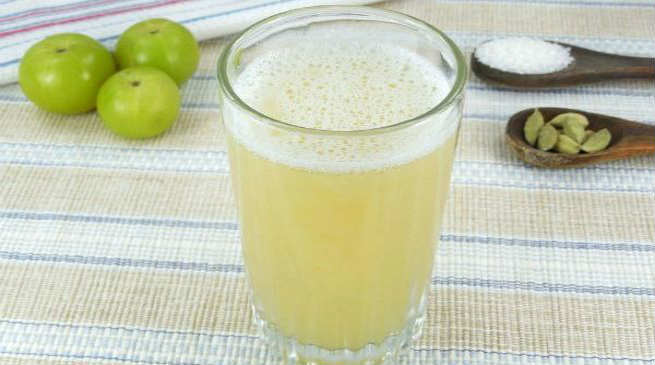 Enjoy your healthy, homemade and refreshing amla juice. The antioxidants in amla juice help fight the free radicals that cause aging. Regular consumption of the juice keeps your skin free from wrinkles and makes it glow. Amla juice is very cooling for the body. Drinking amla juice every morning avoids appearance of pimples on the face. It also fights pimple causing bacteria. You can even topically apply amla juice on acne and pimples. The Vitamin C in the amla helps heal them. Amla juice is a great cleanser. It not just cleanses your system from within when consumed, it can also be applied on the skin in order to cleanse it. Simply dab a cotton ball with some juice on your face and gently cleanse it. It removes excess sebum and fights acne causing bacteria. Amla juice can also help treat pigmentation like all other fruits rich in Vitamin C. Apply some amla juice on your face as a face pack and leave it to dry. Wash off with cold water. This helps you get rid of tanning and blemishes in your skin. Using amla juice as a face pack or drinking it regularly helps in toning your skin and keeping it firm due to its anti-aging properties. Amla is not just great for the skin but also for the hair. Amla oil has been used for generation to promote hair growth. Read more about how to make amla oil and its benefits here. 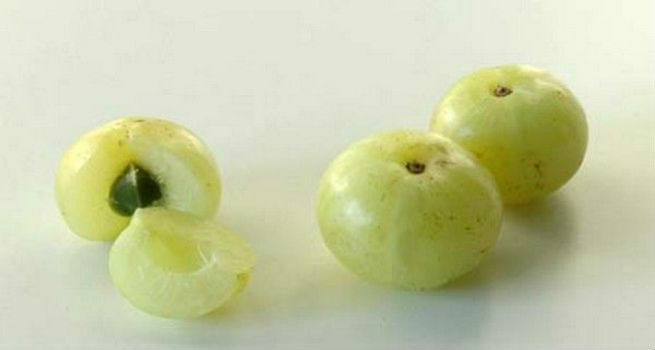 Amla contains tannins which act as natural hair dyes. Using amla juice on the hair as a mask or a rinse helps in preventing premature greying and makes your hair dark and lustrous. Drinking Amla Juice every single day accelerates your hair growth and makes it thick. Amla helps in stimulating your hair follicles and rejuvenates the dormant follicles. This leads to increased hair growth. Rinsing you hair with amla juice as the final rinse cleanses your scalp and also adds a shine to your hair. Amla is an antimicrobial. Massaging your scalp with amla juice helps you get rid of dandruff. So go ahead and make that amla juice concentrate before the season of these miraculous fruits ends. Add it to your diet and beauty regimen and see your skin and hair transform.